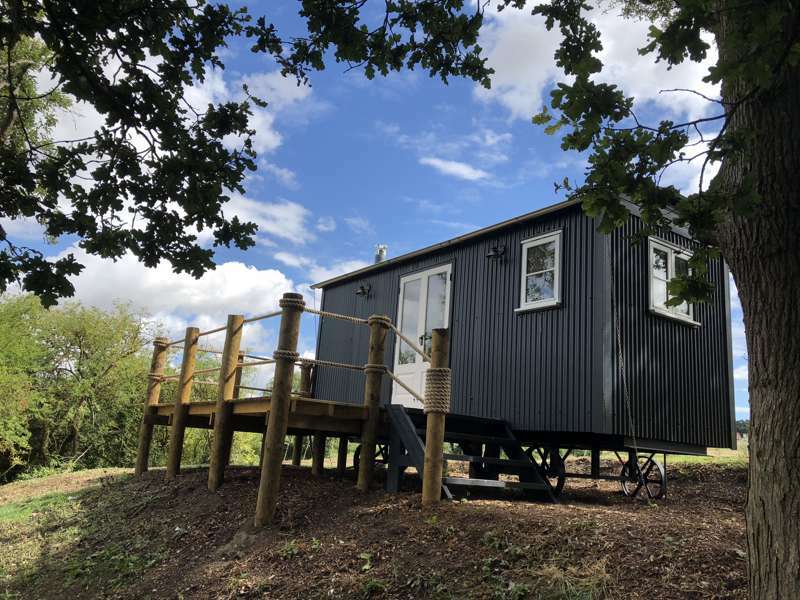 Located on a family farm, the Shepherds Hide huts "Wigeon" and "Teal" are luxurious unique and secluded self catering shepherds huts, tucked away on the heart of the Essex coast, just outside Colchester. 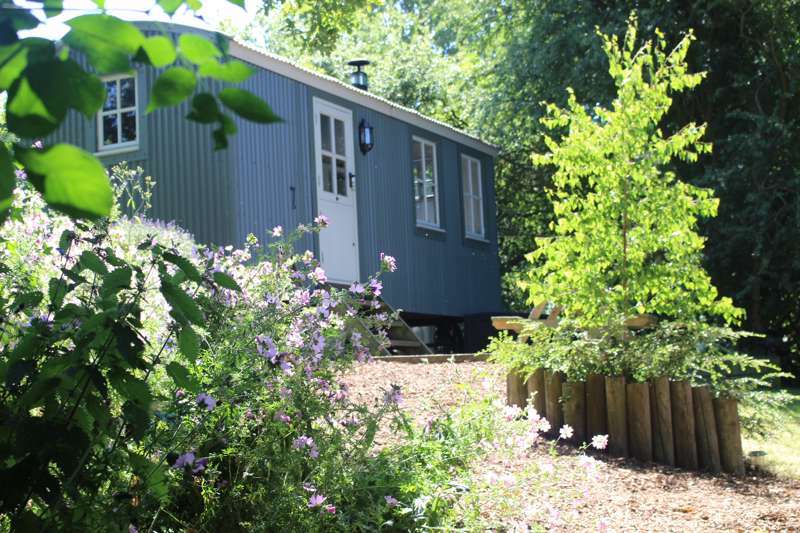 They are perfect for short breaks, romantic getaways or for longer self-catering holidays in the countryside with excellent bird watching and walking on site and a range of tourist attractions nearby. Mill Farm, is about 55 acres of a mixture of arable, grassland, salt marsh, tidal creeks and inland waters and is the home of the only fully restored tide mill in Essex. Reconnect with nature and yourselves at The Shepherds Hide, away from the hustle and bustle of your busy lives. In February 2018 we were voted as one of Essex's top 10 most romantic spots by Essex Life Magazine and we are very proud to have been featured as Number 3 in Adventure Travel Magazine's round-up of the 10 most incredible winter glamping sites in the UK in October 2017. We are also proud to have been featured as Number 25 in The Daily Telegraph's Summer 2016 Top 40 Glamping Campsites in the UK and Europe. For latest availability and best prices for The Shepherds Hide, please use the Date Search above. 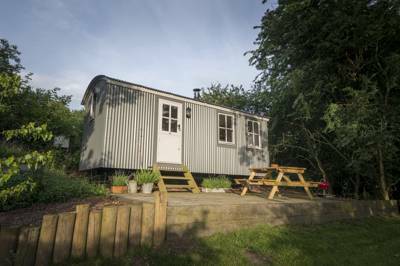 Inside, the shepherd's huts feature a king-sized bed (bedding and towels an optional extra at time of booking), a dining area and a kitchen with plenty of storage, cooking facilities, a kettle, toaster, sink and mains running water. There is an en-suite bathroom with a shower, basin and flushing loo, plus eco toiletries such as body wash and body lotion. A log burner keeps the whole place warm (with the addition of underfloor heating in Teal). Outside, you'll find a picnic bench and patio. Parking is separate but there's a wheelbarrow to easily move your things. The farm is home to the only fully restored water mill in Essex, Thorrington Tide Mill (03330 138156). It's now owned by Essex County Council and opened as a museum between April and September on the last Sunday of every month, some bank holidays and special mill open days. It's just a short stroll from the shepherd's hut. If you fancy venturing further afield by foot, there's glorious bird watching along the Colne Estuary, with footpaths leading directly down to the water from the site. Enjoy the sandy beaches around Brightlingsea – lined with beach huts and backed by a long promenade – or head inland to Colchester, Britain's oldest recorded town (20-minutes in the car). The village of Dedham is also a particular joy, in the heart of Constable country (25 minutes by car). It was here that Britain's greatest landscape artist went to school and today the main street is lined with attractive Georgian houses, old inns and a large art/crafts centre. On arrival you'll be welcomed with a "local goods basket". After that, there are supermarkets in nearby Brightlingsea, while Thorrington itself, offers a local store for basic supplies and a great local pub, The Red Lion (01206 252001). During the Summer – late May and mid July (season length is subject to the weather) – the farm also opens for pick your own strawberries. The Shepherds Hide is located away from this busy hub but it means you can conveniently stroll around the corner to pick and taste their amazing, fresh strawberries! The postcode when put into the sat nav, CO7 8JJ will bring you to the centre of Brightlingsea Road. Keep travelling along the road and on the right hand side you will notice the houses stop and there is a hedge line. You will then see signs for Mill Farm, Thorrington Tide Mill and Hill Farm Landscapes on your right hand side. Turn right into the driveway and follow it all the way down to the bottom. Drive round past the Mill through the metal gate (not over the bridge and through the wooden gates), keeping the mill pond to your left hand side and The Granary (converted farm buildings) to your right. Drive on into the farm yard and park on the left, next to the green container. You will see a small green trailer for you to transport your belongings. The huts are located down a short track that starts just to the right of the chicken run. Mark and Polly can be found in The Granary converted Barns. The nearest railway station is Alresford, exactly 2½ miles away. From here you'll have to grab a taxi. Try NwC Taxis (01206 302491) or V P Cars (01206 825001). 2 luxury shepherds huts in private areas of a 55-acre farm.